Schumi0101: A memorable weekend with NWKRTC’s Airavat Gold Class. 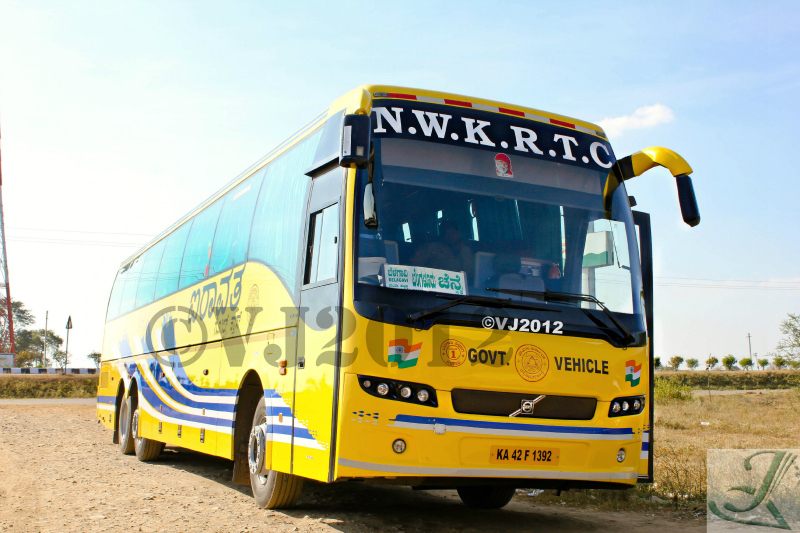 A memorable weekend with NWKRTC’s Airavat Gold Class. My return journey to Bangalore was fixed and this time there was no doubt about which bus I was taking. The sensuous NWKRTC’s Airavat Gold Class. My tryst with Gold Class started almost a year ago when one of my pictures of Gold Class landed up in the NWKRTC website. 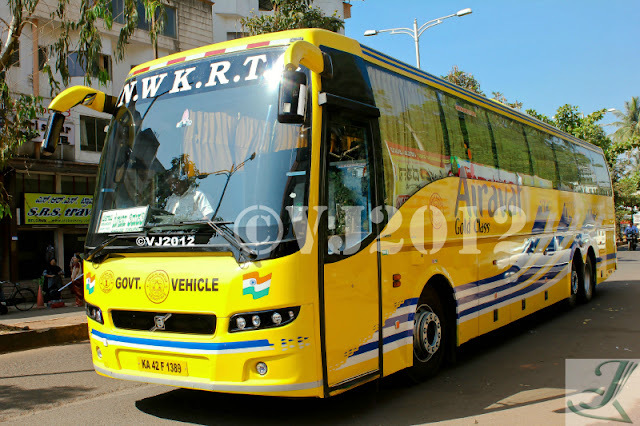 Needless to say that I was disappointed on the website developers for removing the watermark on my picture and using the same without my consent however, I was equally happy to see my picture on our state transport’s website. After this episode, I have seen pictures of this particular service on different social networking platforms, heard great things about this service, even got an opportunity to take took few more pictures of this service but finally the time had come to try this service. Even before I reached Belgaum, almost a week ago, it was decided that I would be making few stops in Belgaum and Hubli to meet few ardent bus fans (Biswajit Baruah, Santhosh , Nagesh Vannur ). I reached Belgaum by around 7:30am, thanks to some impressive driving by my friends. Though the previous night’s journey had taken a light toll on my body, I was all excited to meet these members and make the most of our meet. So my first stop was at Ramdev, Belgaum. After meeting the gang and having breakfast, I was at Ramdev, with Biswajit and Nagesh when I spotted the Belgaum-Tirupati Gold Class. She stood at the side waiting to pick up passengers. The bus was gleaming under the shinning sun and it was very hard to take my eyes off the bus. I immediately headed out towards the bus and started taking few pictures and decided to take the same bus to Hubli to meet another bus fan, Prashant Kallimath. Elaborate plans were made almost a week ago and Prashant had invited me for lunch at his place. I bid good bye to my friend Biswajit at Belgaum and boarded the Gold Class. It was a brand new bus with around 1.5lakh kilometer done on the Odo. The bus had two crew members, a driver and a driver/conductor. The interiors were maintained very well. The bus when compared with Club Class has 53seats without calf support. I was the only passenger to board at Ramdev and the bus slowly made its way to Belgaum Central bus stand. Here around 15passengers boarded the bus, few traveling to Bangalore and few more traveling to Tirupati. Both the crew was fairly new and the driver who was driving the bus had finished his training a couple of months ago. We departed from Belgaum at around 11:45pm. The driver was struggling to negotiate the bus on the crowded streets. Slowly we made our way to the highway and I was expecting the driver to shun his fears here and drive the bus as he is supposed to. However, I was wrong the driver was lugging the bus and was scared to overtake trucks on the highway. Finally on an empty stretch, he touched the speeds of 70kmph and then slowed down. After crawling all the way, the bus entered the 2-lane which leads to Hubli Airport. Here my driver did something which he hadn’t done till now. At a steep curve, he tried to overtake 3 trucks at one go which were trailing one behind the other. He made the move and passed the first truck and then everything went wrong. A car carrier came in from the opposite lane and the driver panicked. The car carrier coming from the opposite lane had little space to his left and he went off the road and the truck on our left side went off the road as well to ensure our bus avoid a head on collision. I witnessed all of this sitting at the front row and my faith with the driver was shaken. Finally my drop off point had arrived; saw my friend waiting to pick me up. Got down and bid adieu to the bus. After having a heavy meal, thanks to Prashant Kallimath and his family, I was eager to get back into the comfort of gold class and sleep all the way till I reached Bangalore. Prashant dropped me at Hubli new bus stand and the Gold class was yet to arrive. We both went on with a quick bus hunting session in the bus stand and while we were at it, the second Gold class showed up. This was the Belgaum-Chennai Gold class. There were already many passengers waiting for this bus. The bus also had around 30passengers in it. Prashant asked me to board the bus immediately to ensure I get a seat. I boarded the bus and took my seat. The bus slowly started to move and I bid good bye to him. I took my seat and was rest assured that my journey to Bangalore was one smooth ride. But again I was wrong…!!! The bus after picking up passengers from the Hubli Old bus stand made its way to Kamat restaurant near Varur and stopped for Lunch. After the lunch break the bus resumed its journey and I decided to take the conductor’s seat at the front. I switched over my seats and was ready to take some pictures and videos of some high speed action on the highway. However, things went completely wrong when we reached the outskirts of Haveri district. A political party which had organized a massive rally to showcase its strength had just concluded and the people who had come from different parts of the state emerged on the highway to board their buses. An estimate of over 1lakh people had come to witness this event and the highway was blocked on either side with the both KSRTC, private buses and with all kinds of transport vehicles. The organizers had not made elaborate arrangements and thus people were stranded on the highway searching for their buses which had brought them to the rally. This resulted in a massive Jam on the highway. The crew was asking passengers not to alight from the bus however it was getting very difficult to sit inside the bus since the bus was not moving. After a pain staking wait for almost 1.5hrs, the traffic began to crawl ahead. However the traffic again came to standstill and finally after 2hrs we were able to cross the Bypass road. In all it took 2hrs to cross a stretch of 1.5kms and it was time to face the harsh reality. 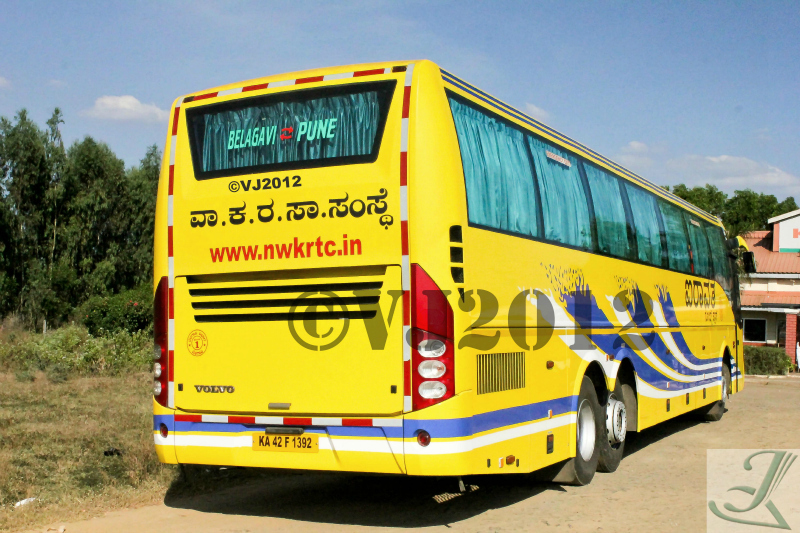 The bus which was supposed to reach Bangalore by 10pm will only be reaching by 12am. The crew informed the same to the passengers and advised the passengers who were getting down in Bangalore to make elaborate arrangements to reach home after alighting from the bus. Though we crossed Haveri, there was heavy traffic on the highway. However our driver was driving exceptionally well to ensure to make up most of the time lost on the highway. We crossed Davangere by around 7:30pm and crossed Sira by around 10:30pm. Few of the Bangalore bound passengers requested the driver to stop the bus for a dinner break and the driver obliged. We stopped at a restaurant near Dabaspet. The crew was requesting the passengers to hurry up as they were running late. At our break, both the Gold class buses coming from Chennai and Tirupati joined us. The place was flooded with multis from VRL, SRS, I-shift from Sharma, Konduskar sleeper to Pune, HKB to name a few. I was completely exhausted to take pictures of these beauties. We finally departed by 11pm and we were nearing Nelamangala. The conductor started getting calls from passengers who had booked ticket on this bus to Chennai from Bangalore. He went on patiently answering every call, explaining the situation and told them to wait at the bus stand. 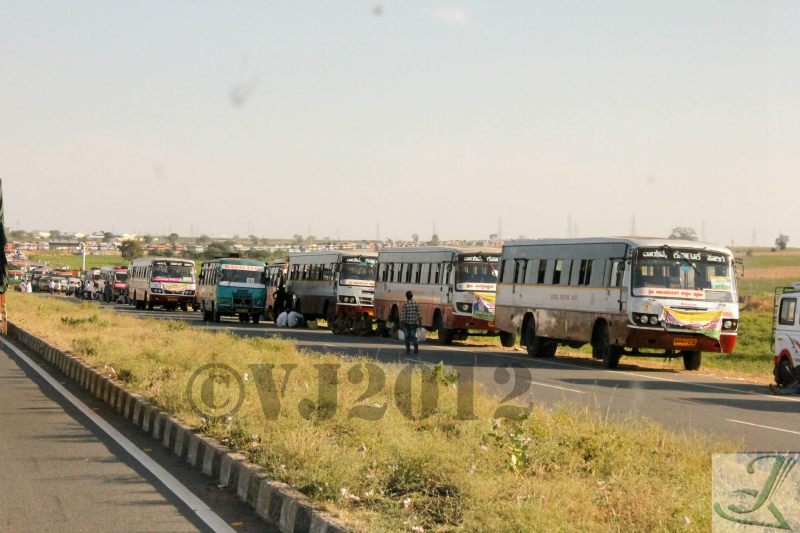 The bus finally entered the elevated Yeswanthpur toll way and made its way into the city. I was dropped off at Navrang at around 11:45pm. Apart from the jam created by the political rally, the journey was very comfortable. The crew was both experienced and courteous and was handling the situation in the best possible way. Despite the fact that we lost a major chunk of time, both the drivers tried their best to cover up for the lost time.. If need arises, I will definitely try this service again. I traveled in the same Airavata gold class (KA42F1411) Bangalore to Hubli in 5.30 hrs..Amazing speed..
One stop of 10 mins in Hiriyur.